I cannot express how thankful I am to have a daddy like you. You provide so much for us...with tender loving care and lotsa love. You taught us to be great individuals. We will not be who we are today without your patience and guidance. Have a wonderful birthday and many, many more happy days like today! 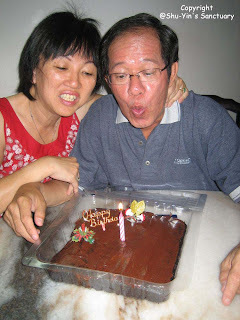 I baked dad's favourite cake - chocolate cake! It turns out erm....kinda ugly. 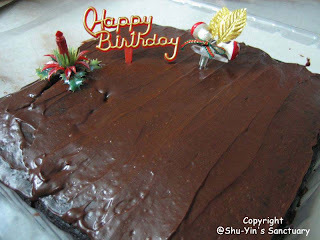 I did not have a wide knife or a big spatula to spread the frosting on the cake...so it looks kinda ugly! Dark chocolate cake after taken out from the oven. After spreading the chocolate frosting on the cake - pretty uneven, huh? Coz I don't have an offset spatula! Decorating the cake with ornaments. 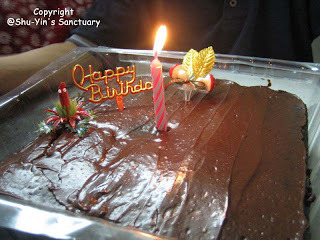 Cake with the candle lighted. 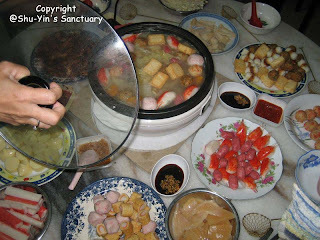 Mum & Ah Yee prepared steamboat for dinner. Wah...the varieties and amount of food spread on the table can feed an army! hehe. 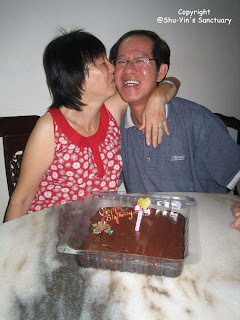 Mum giving dad a Birthday Kiss. 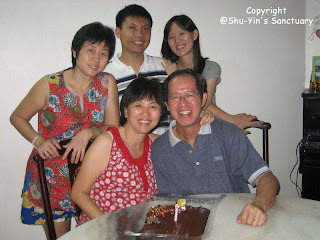 Happy Family...minus Peter (photographer) & Wen & Jen Tze & Rainbow. 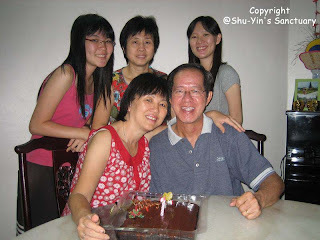 Happy Family....minus Min (photographer) and Wen & Jen Tze & Rainbow. 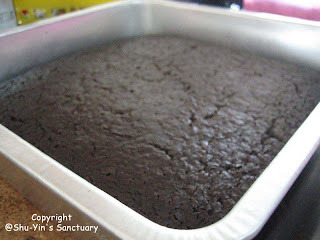 Chocolate Cake: Preheat oven to 350 degrees F (177 degrees C) and place rack in center of oven. In an ungreased 8 inch (20 cm) square cake pan, stir together the flour, sugar, sifted cocoa powder, baking powder, baking soda, and salt. Add the melted butter, water, lemon juice, and vanilla extract. With a fork, mix all the ingredients together until well blended. Bake in preheated oven for about 35 minutes, or until the cake springs back when lightly pressed and a toothpick inserted in the center of the cake comes out clean. Remove from oven and place on a wire rack to cool. 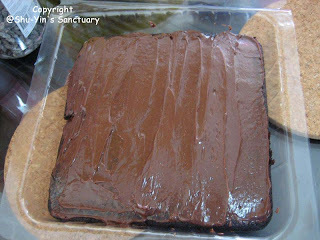 Frosting: Place the chopped chocolate in a medium sized stainless steel bowl. Heat the cream and butter in a small saucepan over medium heat. Bring just to a boil. Immediately pour the boiling cream over the chocolate and allow to stand for 5 minutes. Stir until smooth. Let the ganache sit at room temperature until slightly firm (about one hour) and then beat the ganache until creamy smooth and light. 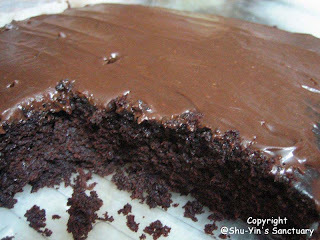 With an offset spatula or knife spread the ganache over the cooled cake. for home-baked quality ..boleh tahan la.